Dr Emma Kennedy is a research scientist specialising in coral reefs, with an interest in climate change impacts on reef communities. Originally trained as a zoologist, she completed her PhD in Caribbean reef ecology at University of Exeter in the UK, in 2015. Her research has a strong spatial component. Examining spatial patterns from the microscopic (molecular ecology of Caribbean coral symbionts, EU-FP7 funded FORCE project, Exeter University) to the macroscale (global analyses of coral reef futures under continued climate change, 50 reefs, UQ), has helped her linking ecological patterns and processes to environmental drivers. Scaling up observations from local (coral reef soundscapes across Las Perlas Archipelago, Panama, Smithsonian Tropical Research Institute) to regional seascape scales (ocean acidification impacts on coralline algae along the Great Barrier Reef, Griffith University) can help understand rules of biological responses to environmental change. Much of Emma’s research involves making detailed field observations. Over the past five years she has led over 23 diving research expeditions from the Coral Triangle to the Caribbean. Since moving to Australia she has worked on a number of high-profile research initiatives, including using coralline algae to explore effects of ocean acidification across the Great Barrier Reef, locating important coral reef refugia for the global conservation initiative “50 reefs”, and running the Seaview Survey Project, a reef monitoring program using underwater camera-scooters and AI in to scale up our ability to detect changes in coral reefs in space and time. Emma is a participant in the Homeward Bound program and was highlighted as an emerging leader in the #AusScienceHeroes campaign. 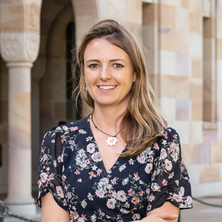 Dr Kennedy is enthusiastic about communicating research to the public, seeing immense value in wider public engagement, given that outcomes for coral reefs are largely dependent on societal change. To facilitate better pathways to impact, Emma focuses on public outreach and community engagement to better communicate her research and coral reef research more broadly. Diaz-Pulido, Guillermo, Kennedy, Emma V., Nash, Merinda C., Lewis, Bonnie and Ordonez, Alexandra (2015). RECENT PROGRESS IN THE PHYSIOLOGY, MINERALOGY AND ECOLOGY OF CORALLINE ALGAE IN THE GREAT BARRIER REEF AND IMPACTS OF FUTURE OCEAN CHANGE. In: , , (90-90). .